If you’re having a new house built, one of the most important decisions you must make pertains to the HVAC system you will be installing. The cooling system you choose is critical because summer is near and you don’t want to be left without a comfortable indoor climate. 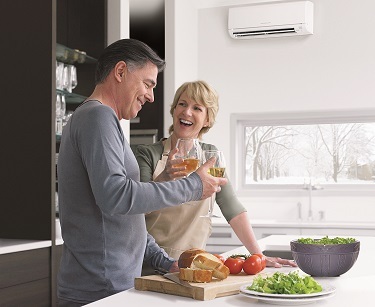 The trusted HVAC contractors from County Cooling, in Shrub Oak, NY, recommend units from Mitsubishi Electric® Systems, which have high-efficiency ratings and feature smart technologies such as wireless thermostats. From April 15 to June 15, 2018, you can get up to $500 in instant rebates on select Mitsubishi Electric Systems that are installed by approved Mitsubishi Electric Diamond Contractors®, like County Cooling. If you have a lot of space, multiple systems per home may qualify for this deal with prior approval. This way, you’re not only saving money from reduced energy consumption, but also on the initial purchase. You and your family can enjoy the unmatched comfort that a floor-mounted, multi-zone, or hyper heat pump can bring with a new system installed by an HVAC contractor. Make sure that your time at home is spent in cool comfort by having a Mitsubishi Electric System installed this spring with instant savings. Get in touch with the leading HVAC contractors at County Cooling for your heating and cooling service needs. Their experienced technicians have been providing efficient and reliable installation, repair, and maintenance service for over 14 years. Call them at (914) 962-2665 for more information.